If there’s ever been a time for a giant welcome banner and an offering of understanding and friendship, it’s now. There are millions of refugees on the move today, this very minute. They’re on the move because they have to be, often fleeing from their home because of the threat of war. 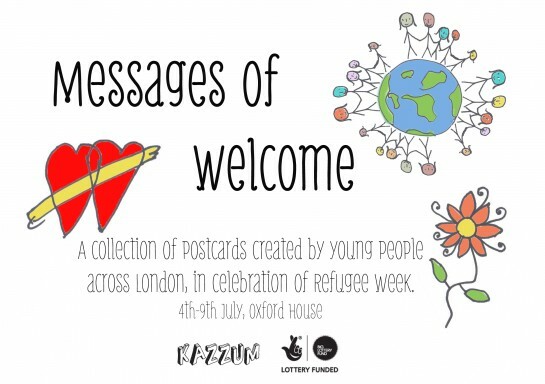 Here at Kazzum, very proud residents of Oxford House, we’ve made it our mission to celebrate the welcome we can offer to refugees and asylum seekers this Refugee Week (20th-26th June). 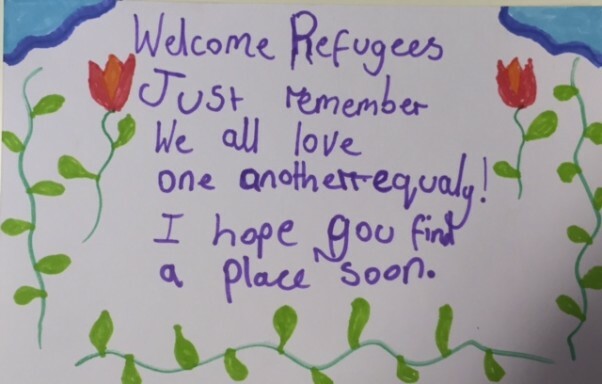 We know we can’t put a welcome banner up for every refugee that comes to the UK, but we can offer messages of welcome. There’s no better way to send a special message like this than to put it on a postcard! So, we’ve been busy this week visiting hundreds of school children across London to gather their very own personal (postcard) messages of welcome. Running workshops and assemblies in schools, our team has been seeking to encourage and inspire communities to welcome new arrivals in the weeks, months and years to come. It’s been a joy to meet lots of little learners across London. In each workshop we’ve used a series of creative tasks and discussion points to engage students in a conversation about the positives of welcoming refugees, building empathy and on challenging negative stereotypes. We’ve also been lucky enough to take young refugees who are part of our outreach programme along to these sessions; the students we’ve worked with have had a chance to hear directly about the experiences of these brave young asylum seekers. 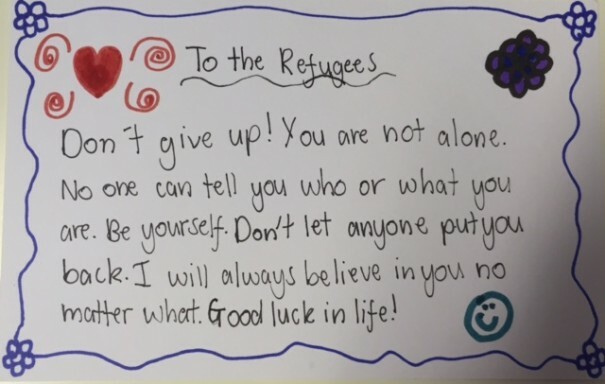 We’ve had wonderful feedback from the pupils and teachers we’ve met this Refugee Week, who hopefully now have a new outlook on how can welcome refugees in the UK. Sat on one of our desks in the office is a mountain of ‘Welcome’ postcards, created by the school children we’ve met in workshops this week. They’re moving, sweet and funny – a real testament to our ability, as a country, to spread our arms in welcome. We can’t wait to distribute the postcards to Refugee Community groups in late July. You can come and see our big postcard display at Oxford House Gallery between 5th-10th July, or visit our social media pages to see the postcards online. We hope to see you there.